Getting traffic to a website is the most important task for any blogger and webmaster. As traffic depends on many factors, most of us work on SEO mainly, which includes both on page optimization and off page optimization to pull traffic from search engines. SEO helps a lot to gain initial traffic from search engines and make your website popular. But the old content and optimization techniques won't help you to get traffic in the long run. Here come Domain Authority and Page Rank in the picture. Since Google has stopped updating Page Rank now and so Domain Authority has become one of the most important factors that decide the quality of a blog or websites. Now bloggers mainly focus on increasing domain authority. Domain Authority (DA) is a metrics that has been developed by MOZ. It is one of the most popular parameters of SEO. 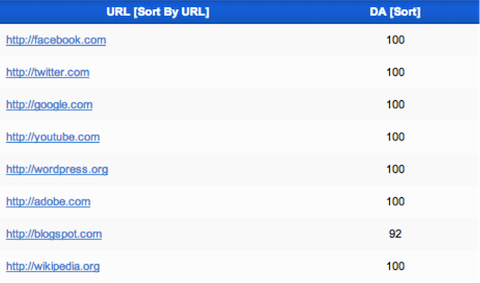 The higher the DA, the more you will get ranked in search engines and hence the more traffic you get. But domain authority is not something that you can increase in a day or week. As you know, this is critical for ranking, and so many factors have been considered while deciding DA. If you work on all those, definitely you will get higher domain authority. So now the obvious question is how to increase domain authority? 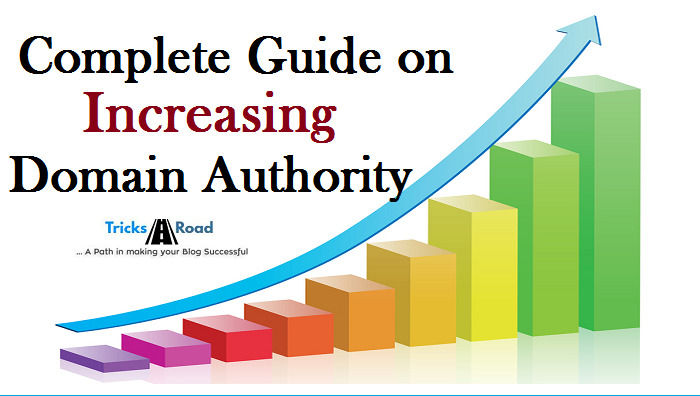 In this guide, I am going to tell you the five most important steps to increase domain authority of a website. But before going to those steps to increase domain authority, let me tell you few facts about domain authority. The term DA is a self-explanatory word which decides the popularity of a domain. Below are the few facts about domain authority which will help you to understand domain authority better. 1. DA is based on many factors like the link profile such as how many links are pointing to your website. 2. You can't increase domain authority in a day or week. It takes time but if you will follow my approach, you can get higher domain authority. 3. MOZ updates domain authority frequently. A couple of months ago they updated the domain authority and TricksRoad's DA got increased from 19 to 23. So if you will work on increasing domain authority, you will get the result quickly. 4. Domain authority is scaled between 1 and 100 and depending upon the parameters your website can have any value between 1 and 100. Gaining a DA of 100 is tough. Sites like Facebook, Google, and Twitter are having DA number of 100. But don't get disappointed if you are not hitting 100. So how to increase your Domain Authority? How to improve domain authority of a blog or website is a very common question that is being asked. So in this article, I am going to give you an answer to this question- How you can increase domain authority of a website. 1. Remove Bad Links pointing to your website: Here you should remove the bad links pointing to your website. Bad links can harm your SEO and so need to consider immediately. You can take help of online tools to check the links to your site. 2. Get High-quality links: Obviously, as we know links plays a critical role in SEO. So try to get as many high-quality links as possible. You can do this in a couple of ways. Either you can hire an agency to do this. But this method is bit costly and have risks. The second method is creating high-quality contents and those contents which are shareable and linkable. This can include interviews, expert roundups, guest posts, etc. These kinds of posts are highly shareable and linkable. This second method is completely white hat technique, and there is hardly a chance of getting penalized. So now have a look at the five best methods to increase the domain authority of a website. This is the very first and critical step to increase domain authority. High-quality links will not only help you to increase the domain authority but also it will help you to get higher rank in search engine. There are many ways using which you can get high-quality links. For example, you can write a guest post on some high PR and DA blogs. Also, you can get some quality links from the well-established forums. You can read my article how to get best from forums for more details. Even you can ask your fellow bloggers to give you links. But again beware while creating links and you should not create low-quality links as that will decrease the authority and SERP of your blog. If you have low-quality links then immediately you need to work to get those removed. This has a direct impact on the domain authority. DA directly depends on your content. Increasing DA is indirectly related to content marketing, and for content marketing, you should have linkable and shareable content so that others should get attracted to share your articles and even other bloggers should use your article link on their blog for reference. If you are writing articles that have enough information and are well structured then even, it can appear in Google news. What best else can happen apart from this. Sometimes ago I wrote a complete guide on How to make money from a blog. Here I listed around 21 proven methods of earning as a blogger and it was a 2100+ words guide which was shared by a lot of bloggers. Like this, you should also try to write a complete guide which anyone can follow and be sure to get lots of links and share. This is going to help a lot while increasing DA of your blog. Increasing DA of a blog or website completely depends on the SEO of a website. It almost considers all the parameters of the search engine optimization. As we know, SEO consists of both on page optimization and off page optimization. On the page, optimization includes well-formed URL, Title of the post, Meta Tag, Description and internal article linking. Internal linking plays a vital role in on-page SEO optimization of a blog. Also, it increases the page views and average time per page views as you are giving your readers some solid reason by providing different good quality articles for reading through internal linking. 1. Interlink your pages and posts with relevant keywords. As you can see in this article, I have done. 2. Use a different variation of keywords while interlinking. Make sure you are not using the same anchor tag again and again. 3. Don't only link your pages and posts. Also, try to link few external high-quality pages and posts. For example, you are writing an article about "How to create a website" and you found someone else has written a quality post then give a link as a reference. Make sure you are only linking high-quality sites for external links. 4. Also, make sure all the links that you have used are working properly. If you are frequent to social media, you must have seen many bloggers and webmasters complaining about the unusual traffic and links from some spam sites or irrelevant sites. This traffic and links decrease your SERP and hence the authority as well. The best ways to get protected from such types of issues are continuously tracking your site. You can do Blog Audit for this. Don't worry you can do blog Audit for FREE as well with the help of internet marketing tools like Ahrefs, GSA, etc. Also Read: 31 Experts Have Shared Their Best Link Building Tools. What are yours? 1. On some websites, you will find a link, "Request to remove". Fill that form and request to take off your blog's link. 2. E-mail to the owner of the blog or website, explain the issue and request to remove the links. By this way, you can be safe from any penalty from search engines. Also by doing periodic link cleaning, you'll gain a huge benefit. This is something that many bloggers and webmasters don't do. Many bloggers do only when they receive a message in webmaster tool. So don't wait for the Google to tell you/penalize you, do quick scanning frequently. Domain age also affects the domain authority and higher the domain age the high domain authority you will receive if you have good SEO. Domain age doesn't come more in the picture, but it does affect the domain authority. I have seen many old areas having very high DA. But again this is subjected to the above conditions. You can’t expect high DA of a couple of month blogs (with new domain name). It much depends on the age and popularity. But once you start implementing above mentioned methods, I am sure you'll start experiencing increasing domain authority. The domain authority of any website doesn't depend on backlinks or any one factor. There are numerous of factors that affect the DA. Above are the 5 top factors that influence the DA most. So this was all about how to increase domain authority fast. Hope this article will help you. If you any other method to increase domain authority quickly, please share with us. What is your domain authority? Do let me know in comments and also what all are the factor you consider to increase DA, please share with us. Have you joined the list of Awesome TRICKERS? If not, just enter your Email ID in the below form and get our latest & Quality updates directly in your INBOX.